It’s hard to believe but it’s been 14 years since we were introduced to effervescent Ariel, adorable Flounder, and musical Sebastian. The Little Mermaid has been a beloved animated musical film enjoyed by both young and not so young, and Ariel has taken her place among the small but growing group of Disney princesses. The Little Mermaid was Disney’s first fairytale in 30 years, preceded by Sleeping Beauty in 1959. Between Sleeping Beauty and The Little Mermaid, the studio churned out many hit movies, but none in the fairytale genre. Ariel is a feisty and funny character and this is a charming story with unforgettable songs. This new HD edition is more spectacular than ever. Seeing all the beauty of the sea unfold in high definition is remarkable. New bonus features include a look at the Disney Animation Studio, which is described as “animation heaven.” The animators, both young and old, form a close knit Disney family. They feel they are “continuing the legacy” of the original “nine old men” who worked closely with Walt Disney and helped build the foundation of the Disney studio. Another additional feature is a storyboard look at Harold the Merman, whose scene was cut from the film for time. Harold had also made a deal with Ursula and was unable to pay her back for the strength she gave him. So he suffered the wrath of the sea witch. A particular interesting bonus is a look at how the animators use live action shoots to help them create realistic movements and expressions in animated characters. This is a look at how the filmmakers shoot scenes using live actors (not those supplying the voices for the characters) then use them for reference when animating the films. Among the scenes shown are some from other classic films as well as The Little Mermaid. Jodi Benson and her family give viewers a little glimpse at The New Fantasyland in Walt Disney World. Having been there I can say from personal experience that this is an amazing addition to the Magic Kingdom. Benson also shows viewers a glimpse of the new Animation Resort, which I can also confirm is a magical resort at WDW in Orlando, Florida. 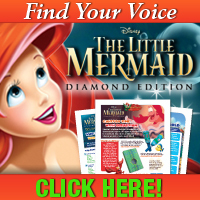 The Little Mermaid Diamond Edition is available in a 3-Disc Blu-ray Combo Pack (Blu-ray + Blu-ray 3D + DVD + Digital Copy + Special Music track Downloads), a 2-Disc Blu-ray + DVD Combo Pack that includes Digital Copy, and a 2-Disc Blu-ray + DVD Combo Pack. With high-def, it’s time to go back Under the Sea.